Adventures in the Endless Pursuit of Entertainment: Happy Birthday Ferris! 7 years ago today, I was sitting in my office in San Antonio feeling sorry for myself. I had already been to New York City and knew that I wanted to live there but nothing was happening with the transfer request I made in December. I had NPR's All Things Considered playing as usual when the announcer said, "Ferris Bueller turns 40 today." I was shocked. That meant that I would be 40 soon! Oh my goodness - FORTY! Well, in 7 years I would be and there I was just sitting there when that dream was out there just waiting to come true. That night, I stayed late to borrow the work computer and update my resume. I posted it to Monster.com and within days I had calls from New York City lawfirms. The rest is history. 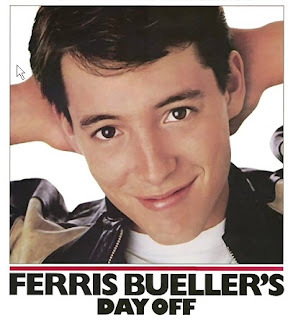 So thank you Ferris (aka Matthew Broderick) for turning 40 in 2002 and I hope you have a wonderful 47th birthday today.